The Law of Sines is a useful identity in a triangle, which, along with the law of cosines and the law of tangents can be used to determine sides and angles. The law of sines can also be used to determine the circumradius, another useful function. The same holds for and , thus establishing the identity. This method only works to prove the regular (and not extended) Law of Sines. 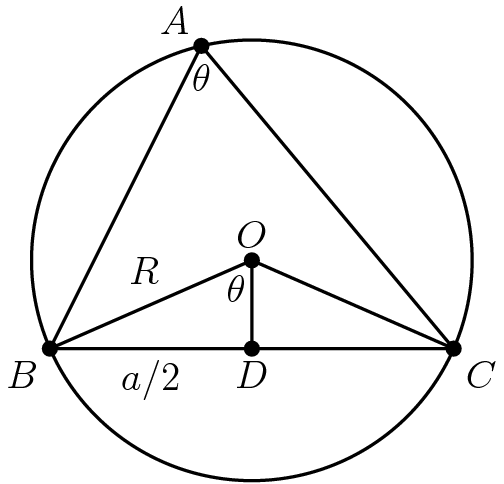 If the sides of a triangle have lengths 2, 3, and 4, what is the radius of the circle circumscribing the triangle? Triangle has sides , , and of length 43, 13, and 48, respectively. Let be the circle circumscribed around and let be the intersection of and the perpendicular bisector of that is not on the same side of as . The length of can be expressed as , where and are positive integers and is not divisible by the square of any prime. Find the greatest integer less than or equal to . Let be a convex quadrilateral with , , and let be the intersection point of its diagonals. Prove that if and only if .